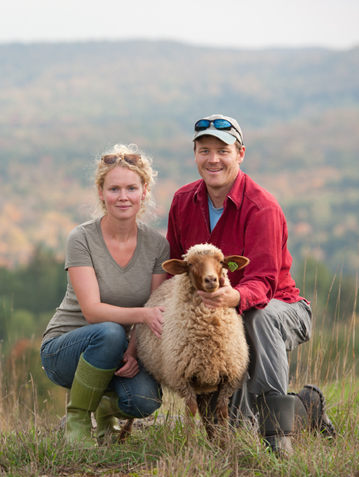 Tamarack Vermont Sheep Farm is owned and managed by Ben and Grace Machin. Ben grew up in South Washington, Vermont on a small organic diversified homestead that was focused on growing food for the family, but also produced apple juice, apple cider vinegar, and maple syrup for sale. After attending college and having a few traveling and business adventures, Ben spent some years working for the US Forest Service in the western US as a Smokejumper. When the Green Mountain State called Ben home, it was to study at the University of Vermont and to work at Redstart, Inc. After settling in Corinth and beginning work on various natural resource conservation projects for Redstart, Ben rediscovered his interest in farming. In 2006 Ben had a conversation with his grandfather Herb during Herb’s final days that led Ben to dedicate himself to revitalizing the flock that been in the family since the 1920s. Grace joined Ben in 2009 and has been a partner ever since, helping make things happen. Raised in Chelsea, educated in Maine, and with a background in architecture, site design, landscaping, and gardening, Grace has designed and general contracted the barn, the farmhouse, developed a line of woolen goodies, and maintained breeding records and customer and accounting information. She's also not afraid to get dirty every now and then.